Retro where it counts, modern when you need it. Hammerwatch is a tough game. Even with three levels of difficulty, customizable gameplay modifiers, and four talented players at the helm of four unique character classes, you'll get no quarter from this retro-styled arcade RPG. 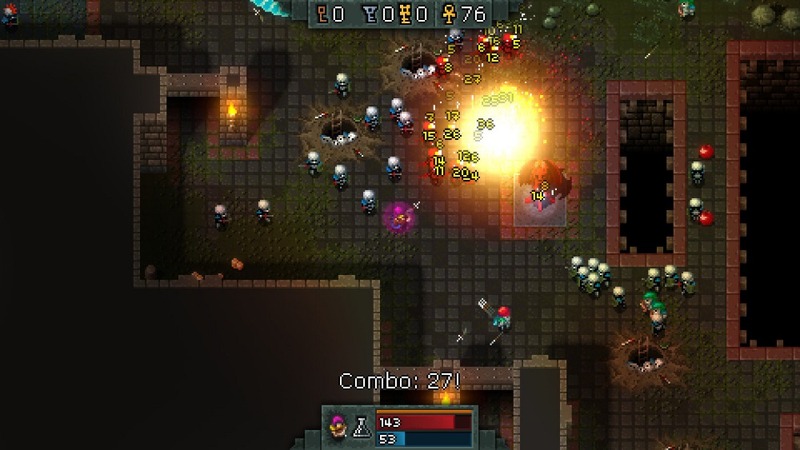 Created by Crackshell, Hammerwatch aims to replicate that old school loot gathering enemy slaughtering co-op adventure feeling in all its glory. It draws heavy inspiration from the likes of Gauntlet, throwing players in a series of foe-filled dungeons with little more than their own abilities and an occasional apple or two to keep them alive. You'll pick up every coin you see, buy every upgrade you can, and spend as much time fighting enemies as you will fleeing from them. But you'll be surprised how motivated you are to mine the game for every secret it has to offer, no matter how many times that friggin' hydralisk plant thing kills you without provocation. 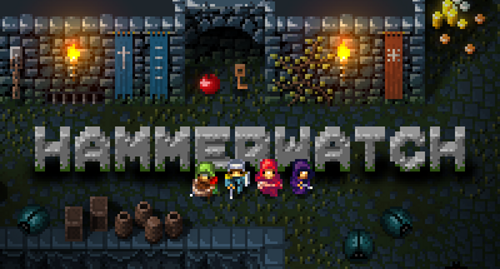 Hammerwatch throws you into the action right away, dropping you in a dungeon with only one way out. Four character classes let you choose an avatar that suits your playing style. Each one has their own strengths and weaknesses expressed through basic melee attacks and a single starting special ability. By finding upgrade vendors throughout the dungeons you can give those basic abilities a boost as well as buy new attacks. Upgrade your health, increase your mana pool, bump up your defense and tweak your special moves as you see fit. Spend money wisely, though, as every coin is hard-earned. Co-op mode allows multiple players to choose the same class, but variety really does serve you better in a game like Hammerwatch. The paladin is by far the strongest character with the most health and the best melee attack. The wizard has low health but high mana, using fireballs instead of a melee attack and upgrading to some very effective spells later on. The ranger fires arrows and sets bombs, extremely useful for taking out stubborn immobile dangers and monster spawners. The warlock works with poison and health leaching abilities that are very costly to use but deal large amounts of damage to groups of enemies while keeping his health topped up. 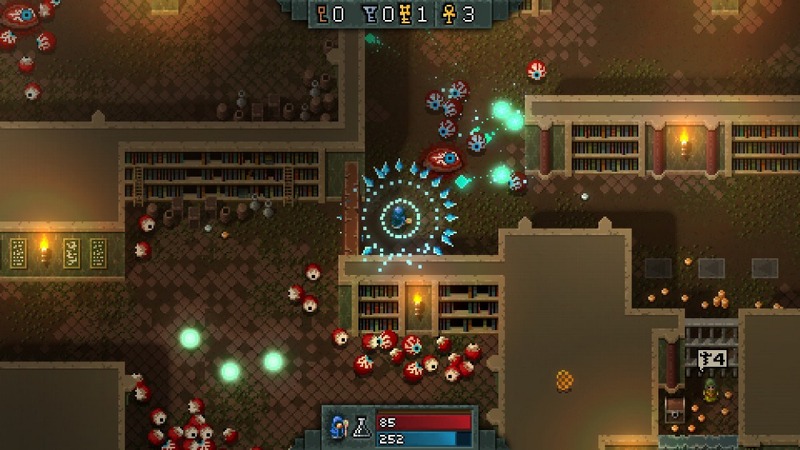 Surviving each floor requires gutting every room and corridor of its enemies. You have to gather just about every key you find to unlock the corresponding bronze, iron and gold doors blocking the way forward. Level design gets intricate with various switches and pressure plates that trigger new passageways. You even have to travel up and down floors to reach out of the way areas that are otherwise inaccessible. You'll give up on trying to keep track of it all, opting instead to simply enter every door and step on every tile. Each set of levels culminates in an epic boss battle, reminding you that yes, the game will get more difficult the longer you play. Hammerwatch uses a slick combo system that gives you a temporary boost whenever you kill ten enemies in quick succession. This isn't a difficult thing to accomplish, seeing as how bugs and skeletons and every other enemy loves to travel in crowds. It can sometimes lead to competition between co-op players who steal kills (on purpose or by accident), but the impact on the game is minimal. Branching off from the main quest, you'll come across the occasional portal that takes you to a nice little bonus level that pays a more direct homage to Gauntlet. Here, amongst blocky pixel walls and old-style chests of gold, you'll vanquish swarms of foes and pick up keys to unlock doors within the stage. Once you wipe everything out you can head back, loot in your pockets and a big grin on your face because, heh, Gauntlet rocks. Now let's talk about secrets. Hidden passageways, rooms filled with coins hovering just beyond your reach, invisible halls, breakable walls, and keys strewn about the level that give you access to even more loot. Hammerwatch is just as much about locating loot as it is defeating enemies, and the game strikes a perfect balance between the two. After clearing out a floor of foes, your next task will be to scour every room to find what secrets are waiting in the wings. Most of them are hidden in plain sight, informing you there's something awesome to be obtained but not hinting as the methods you'll need to employ to obtain it. Hammerwatch is the kind of game that will inspire you to walk around smacking every wall just in case there's a breakable block. Even with focused effort you'll still find some of the secrets are tough to obtain, but that only encourages you to try even harder. Page created in 0.2704 seconds.